Next up was the final AGU General Session talk at lunchtime. Secretary for the Department of Interior Sally Jewell gave the Union Agency Lecture, and she did not disappoint! Secretary Jewell was energized and enthusiastic, speaking about everyone’s natural inner curiosity, the critical role that the government plays in science and research, and the “thoughtful regulation” necessary to make science content translatable and understandable. She referenced the book Merchants of Doubt (which now I absolutely must purchase and read), and how transparent, widely-available data will fight the science doubters. She challenged everyone in the audience to: (1) work together for public/private partnerships; (2) take credit for what you do (let everyone know how important your work is to their lives); and (3) take responsibility for engaging the next generation. She had many great statements during her talk, but I think my favorite quote is: “the best classroom is one with no walls.” By the way, on a short side note, the @Interior Twitter account is my favorite – you will not be disappointed with all of the images of public lands they tweet! 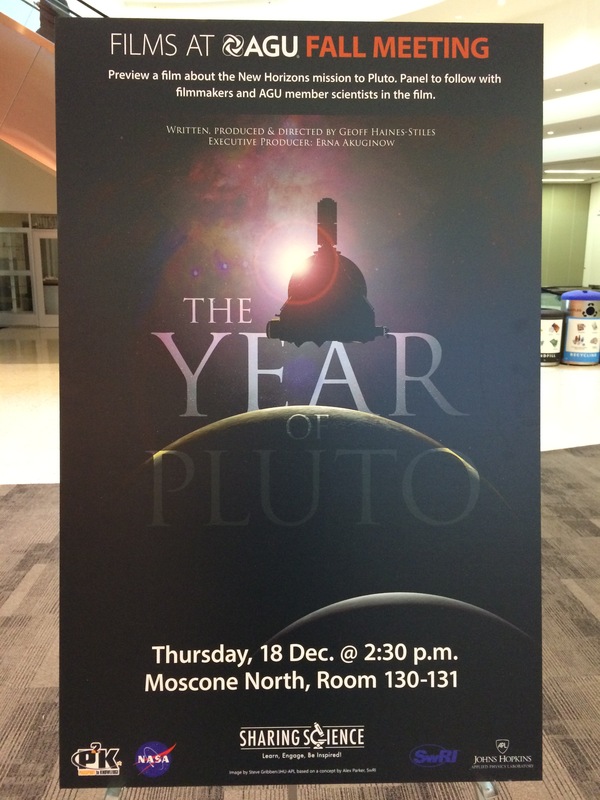 After sitting in on the post-lecture press conference to hear more from Secretary Jewell, I headed over to the “rough cut” showing of The Year of Pluto. Despite four different locations being published in the program book and online for the screening, I arrived in the correct location to a huge room filled with people eager to learn about NASA’s Pluto-Kuiper Belt Mission called New Horizons. Here is a short video about New Horizons and NASA’s official website on the mission. New Horizons will arrive at Pluto in July 2015, and The Economist predicts that Pluto will be the top news story in 2015. Judging by the excitement in the room, I have no doubt this will be the case (and the renewed energy for calling Pluto a planet). I spent the end of the day in a technical session on Unlocking the Educational Value of Hydrologic Research for Development of Student-Centered, Context-Rich, Active Hydrologic Learning Experiences. My goal in attending this session was to gather some fresh ideas on how to use data sets and technology for my EARTH 111 Water: Science and Society course, as well as a summer workshop I’ll be teaching for Pennsylvania middle school teachers. I picked up some great ideas and valuable resources to investigate further, such as the CUAHSI water data center and WikiWatershed. These should be excellent starting points for me to create some new lab activities! I have to end today’s post with this tweet below (which mentions the oceanographic research vessel JOIDES Resolution) that made me laugh and reflect back upon my time at sea on the NOAA Ship Thomas Jefferson earlier this year. With 25,000 people trying to access the wifi at the convention center, you can imagine that is… a challenge, to say the least, to get online and stay online. But after being on the Thomas Jefferson, where internet access was slower than dial-up, I sure didn’t complain about the wifi here in San Francisco! Being on the JOIDES, I will be very, very amused if anybody complains about the wi-fi connection at #AGU14. #JRKau #DontTakeWiFiForGranted! It’s the final day of the conference tomorrow – and, finally, my student presents her work! 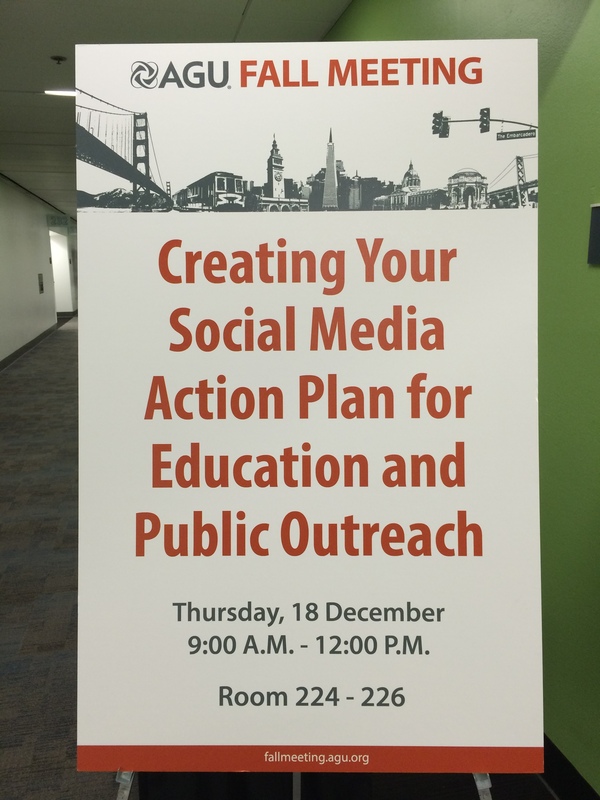 Stay tuned for more on Kimmie’s poster and tomorrow’s citizen science sessions.